Former Ohio State guard Katie Smith was announced Monday as one of seven members of the Women's Basketball Hall of Fame class of 2018. 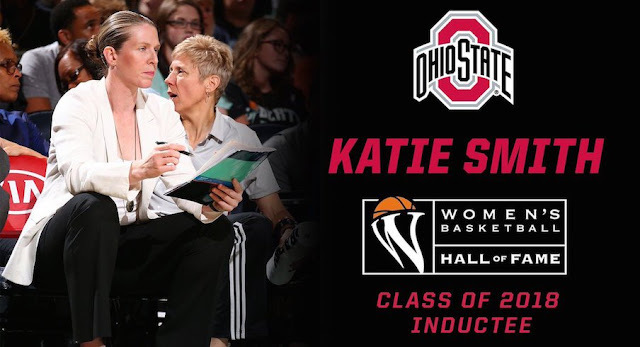 Smith is one of the top women's basketball players in Ohio State history, leading the Buckeyes to the NCAA Tournament final as a freshman in 1993 and finishing her career as the Big Ten Player of the Year in 1996. She was inducted to the Ohio State Athletic Hall of Fame in 2001. After her career as a Buckeye, Smith went on to a 15-year career in the WNBA, scoring 6,452 points over the course of her career and leading the Detroit Shock to WNBA titles in 2006 and 2008, winning WNBA Finals MVP honors in 2008. Smith is currently the head coach of the WNBA's New York Liberty. Smith is also a three-time Olympic gold medalist, having been a member of the U.S. national teams that won gold in 2000, 2004 and 2008. Smith is joined in the 20th anniversary class of the Women's Basketball Hall of Fame by two of her Olympic teammates – Chamique Holdsclaw and Tina Thompson – as well as women's basketball coaches Ceal Barry, Rose Marie Battaglia, Chris Dailey and Mickie DeMoss. The 2018 Women's Basketball Hall of Fame induction ceremony will take place on June 9 in Knoxville, Tennessee.